Doujinshi-Ka’s Inbox: What’s the deal with the green scene?/What race is Integra? Doujinshi-Ka’s Inbox: What’s the deal with the green scene?/What race is Integra? 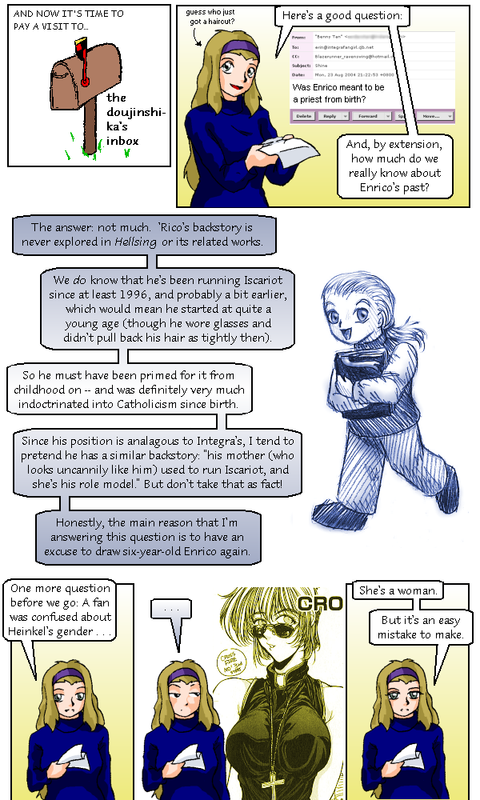 published on 17 October 2004 Read more posts by the author of Doujinshi-Ka’s Inbox: What’s the deal with the green scene?/What race is Integra?, Erin PtahNo Comments on Doujinshi-Ka’s Inbox: What’s the deal with the green scene?/What race is Integra? The T-shirt I’m wearing was made by the very awesome Bkwyrm. And now it’s time to pay a visit to… the doujinshi-ka’s inbox! Erin: Okay, we’re doing another double-header today. 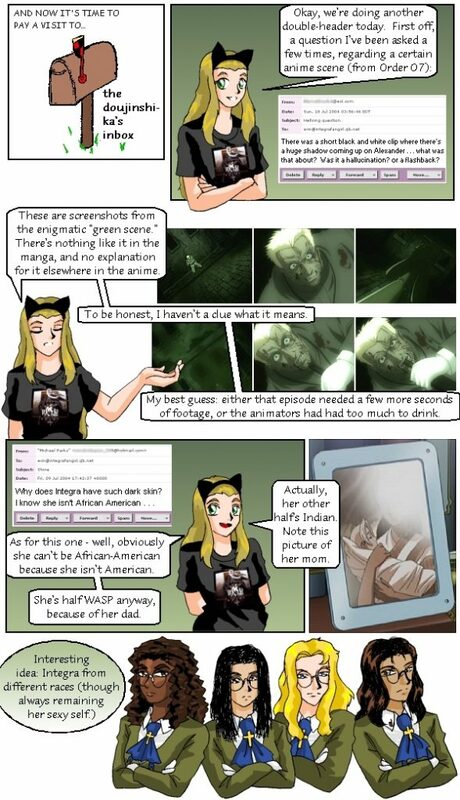 First off, a question I’ve been asked a few times, regarding a certain anime scene (from Order 07): Email: There was a short black and… Continue reading Doujinshi-Ka’s Inbox: What’s the deal with the green scene?/What race is Integra? After I posted this, Lorena pointed out that there are werecats in mythology. Jan McNeville discussed a type of cat demon (the aku-sambiki) in Japanese mythology which could take on human form – but retained its ears. And later, Word Of God came out to say that Schrödinger is a catboy, created by Doc. 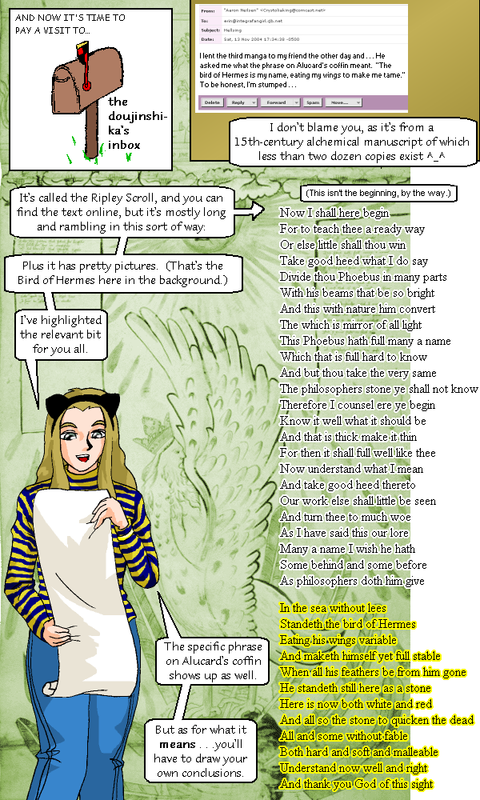 Erin:… Continue reading Doujinshi-Ka’s Inbox: What are Schrödinger and Rip? Doujinshi-Ka’s Inbox: Will Millennium Show Up? Doujinshi-Ka’s Inbox: Will Millennium Show Up? 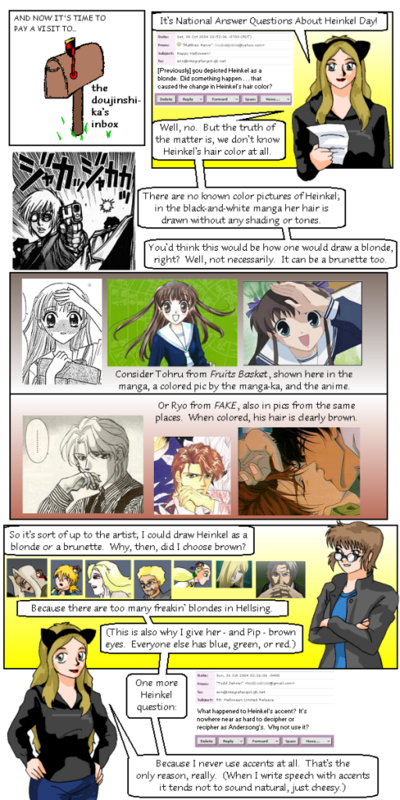 published on 9 January 2005 Read more posts by the author of Doujinshi-Ka’s Inbox: Will Millennium Show Up?, Erin PtahNo Comments on Doujinshi-Ka’s Inbox: Will Millennium Show Up? Note from The Future: Millennium’s first appearance in-universe is the 2005 Christmas storyline. 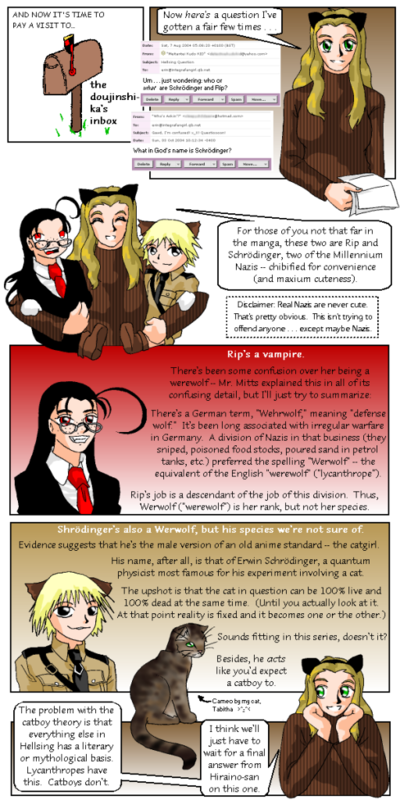 The last chapter of the main Hellsing manga was published on September 30, 2008. 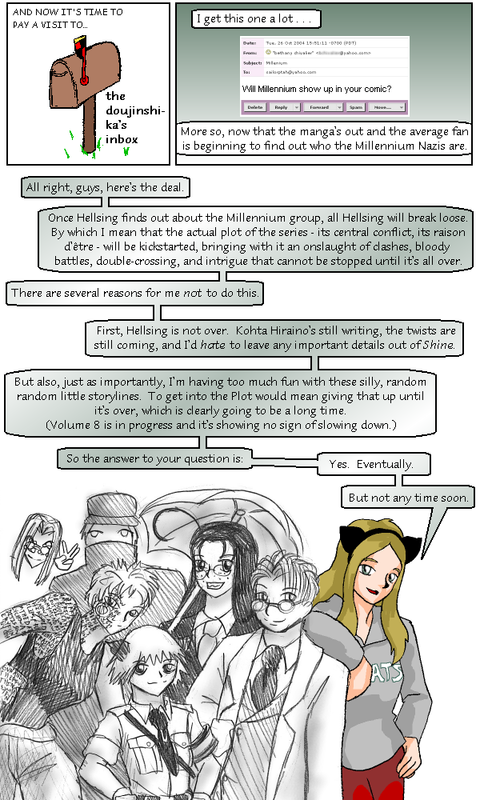 Non-clandestine encounters between Hellsing and Millennium start appearing in Shine storylines at the start of 2009. Erin: I get this one a lot… Email: Will Millennium show up… Continue reading Doujinshi-Ka’s Inbox: Will Millennium Show Up? 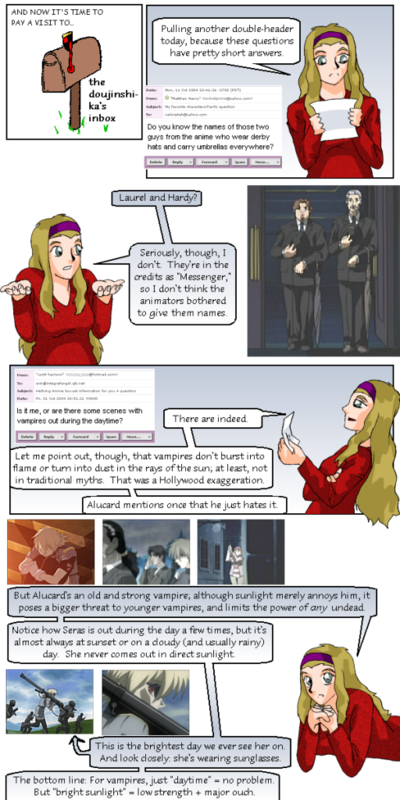 Doujinshi-Ka’s Inbox: Will you link to my site after I plagiarized from you? Doujinshi-Ka’s Inbox: Will you link to my site after I plagiarized from you? 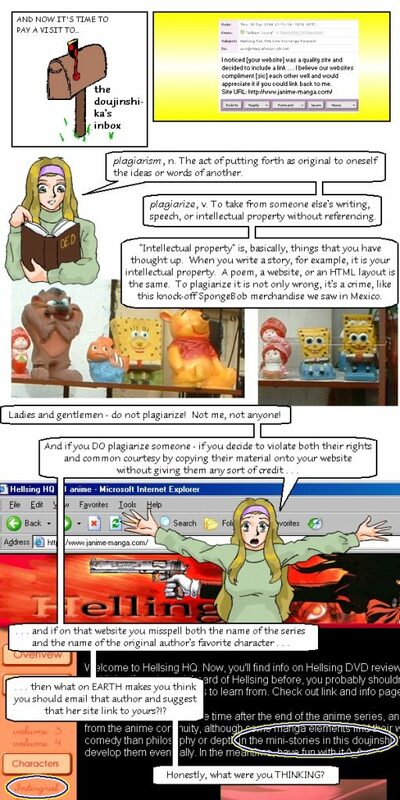 published on 23 January 2005 Read more posts by the author of Doujinshi-Ka’s Inbox: Will you link to my site after I plagiarized from you?, Erin PtahNo Comments on Doujinshi-Ka’s Inbox: Will you link to my site after I plagiarized from you? This site is now defunct, and thank goodness for that.